I'm just back from my visit to the Improv Electronics booth, and as always they have something fun to see. 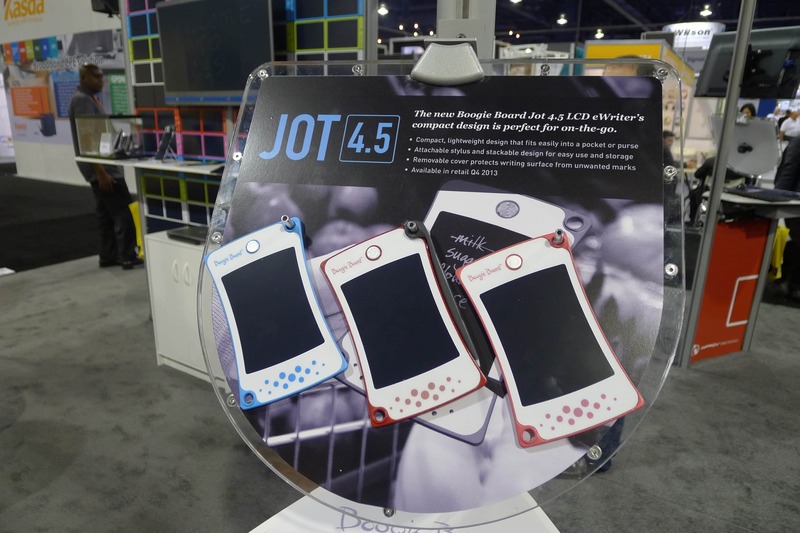 Today's news is ostensibly about the 2 new Boogie Boards, the 4.5" Jot and the 9.7" Sync, but there were also a couple other neat concept designs on display. The image at right show the 40" (ish) blackboard concept which Improv made as an experiment in seeing how big of a device they can make. It's actually 4 panels, not one, and it is their biggest project so far. But it's not a commercial product - not yet. Improv is expanding their Boogie Board line beyond their several current 8" models and they've added a number of useful improvements. The Sync has a larger screen and connects over Bluetooth. There's a desktop companion app which can accept realtime input as you draw on the Sync and display it on the screen. That app will also let you email your scribbles or save them to Evernote (or save them locally). As you can see in the gallery, the Sync is quite thin. It's scheduled to hit the market in time for Christmas 2013. The price is still up in the air. Next up in the "I can't wait until I can get one" category is the Jot. This device features the same proprietary screen tech as on all the other Boogie Board models, only cut down to the size of your average smartphone. The Jot is also due out in time for Christmas, and it was intended to replace the scraps of paper which you or I might jot a note on. It's more limited than some of the other BB models, and in fact it can only erase your scribbles, not transfer them to a computer. It is just about the correct size to hold in one hand while you scribble a note. I plan to get one, and I so wish that it would let me save my notes. I take notes on a small notebook about the same size, so it would be great to be able to swap the paper with something more permanent. The fact it would look cooler than a notepad is also a plus. 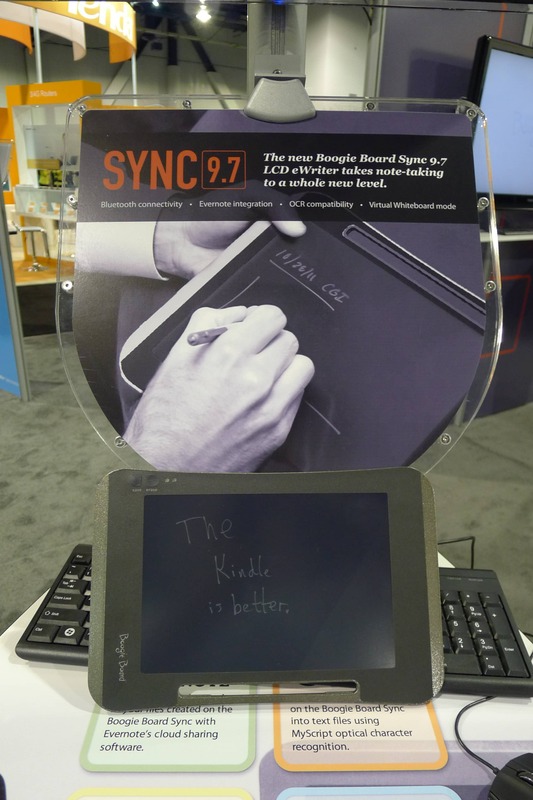 Both the Sync and the Jot use screens developed by Kent Display, Improv's parent company. 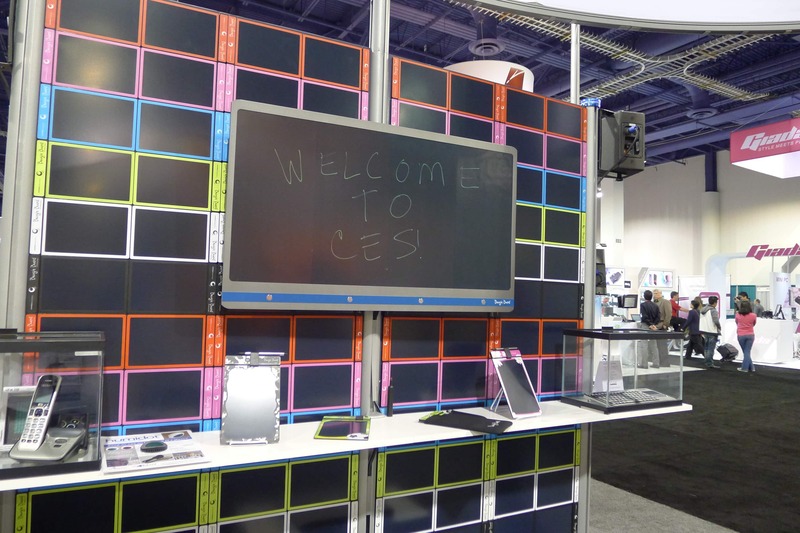 Kent Display has developed a unique low-power display tech based on cholesteric LCD. The cLCD screen used in the Boogie Boards can hold an image without drawing any power. The only power these screens use is when they clear what is currently displayed on the screen. Improv is also trying out their screen tech for uses other than as a writing tablet. One of the images above shows a keyboard concept with a small screen at right. That screen is the same cLCD screen tech used on the tablets, and it would be used as a notepad. It would replace the yellow sticky pads found in most offices, more or less. I've been watching this screen tech ever since the first Boogie Board was released in early 2010. I didn't like it then because it was so limited. I'm glad to see how things have changed. I agree, that Jot looks very nice to have! And if my original BB finally dies (still going strong however! ), that Sync would be a nice replacement. Especially since it’s larger. I’ve said it before: when I can fix a minus sign without having to clear the entire board and start over form scratch, call me. Until there is selective erasure, I am not interested.